Rosie knew what she wanted in a man. Trouble was, she wanted something different every day. The wealthier ladies could afford different models, but they had room to store them too. She’d had to settle for a model with adjustable heads. The body stayed the same, but the personality changed. It wasn’t ideal, but it worked. Currently she had six different versions, but over thirty were available. 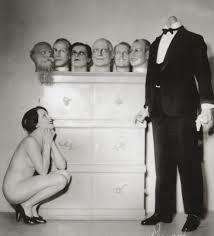 Whenever she could afford it, she got a new head for her Adjustable Man. Rosie’s house wasn’t tiny by any means. It was the standard allotment for Zeta-class citizens – three bedrooms and one large common area with dining/ kitchen/ living room, with movable panels to divide up the areas when necessary. This was a far cry from Gamma-class, with only two bedrooms and a living room but no kitchen. That was shared, communal style, with ten other Gammas. Gammas tended to eat together in the common dining room. Slinking off to eat in their private apartments, hunched over a coffee table while sitting on a stiff sofa, was possible but frowned upon. Nobody would say anything about it to the citizen who did it, but then they simply wouldn’t say anything at all to them for a few days afterwards. It wasn’t planned that way. It wasn’t a rule. It was more like a habit, or tradition. Not sharing time with your fellow citizens meant you wanted to be alone, so they gave each other space at those times. But, if a citizen was absent more than about four times a month and wasn’t on a scheduled trip for their task-group, then subtle and not-so-subtle inquiries were made. Some were to the citizen’s family. Some were to the Overseers. Perhaps s/he was ill? Perhaps therapy needed to be assigned? Perhaps s/he needed to be reclassified? Sometimes that particular area’s citizen class wasn’t a good fit for that citizen’s style of life. Never would they ask a Gamma-class citizen themselves if anything was wrong. That wasn’t thinkable, not for that class. It was only once you were promoted to Zeta-class that you were even considered to have enough spirit to have an opinion. Rosie had opinions all the time, and felt that everyone needed to hear them. The Overseer channeled this into encouraging her to write an online blog, where she felt that she was being heard for a change. She thought she was making a difference. She was wrong. Nobody read her writing. The numbers on the statistics were a ruse from the Overseer to get her to keep writing and thus keep her out of the way. The comments were supplied by workers in his office. It kept her placated and maintained order. It didn’t do to have citizens thinking too much. It upset the social fabric. She was so opinionated that no man wanted to spend time with her, and so insecure that she didn’t want to spend time with herself. Fortunately for her, she was not alone in this. Plenty of women had been told “You think too much” by men, and rather than stop thinking, or at least out loud, they decided to get an Adjustable Man. He could be modified in any way imaginable, providing you had the resources. It was easy these days to pick up a used version, have the memory wiped, and start from scratch. Or, you could custom build one online and have it shipped to you, ready to cook, mow the yard, and be pleasant to take on a visit with your friends. No more awkward times like when your man suddenly started talking about less-than-polite topics around your best friends or coworkers. No more attitude about doing housework or it being “woman’s work”. No, the days of men thinking their contribution to the family ended as soon as they left their workplace ended around the time women realized they didn’t have to have children, and thus didn’t have to stay home to raise them. Adjustable Women were in the works for those women who wanted to work outside of the home after having children. There were never enough reliable or affordable childcare providers – never had been. Come to think of it, the same was true for eldercare. Nobody wanted to take care of the very young or the very old for very long, even if they weren’t related to them. Those that did wanted a lot of money for it, or they had less than honorable reasons for seeking those jobs. But Adjustable Women were proving to be harder to make than Adjustable Men. Rosie was trying to decide who she wanted as her partner to the dance tonight. It was almost as important as determining what dress to wear. Too formal? Too casual? She wished there was a guideline on the RSVP, like “black tie” or “blue jeans” but for partners. She’d hate to take a stuffy, know-it-all partner to a casual gathering, the same as she’d hate to take a sci-fi geek, able to name all Star Trek captains in order (and delineate their flaws and charms) to a company luncheon. How did early-century escorts do it? She opted for the boring “Bob” version. He was cute, but he didn’t talk much. Her friends would understand, and the new people she was there to meet wouldn’t care. This entry was posted in Stories, Women's issues and tagged being silenced, black and white stories, blog, short story, writing. Bookmark the permalink.